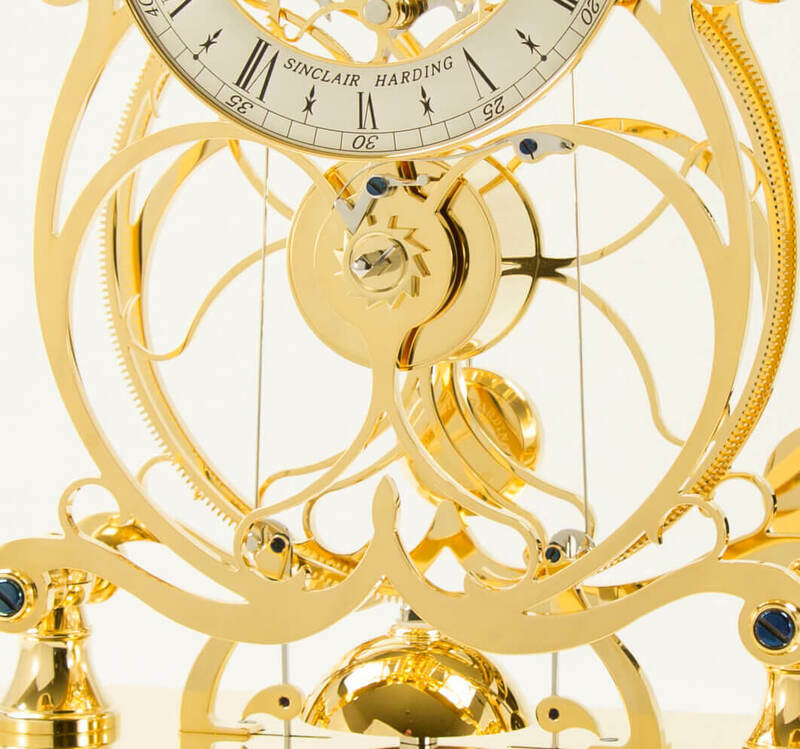 In homage to the James Condliff of Liverpool, circa 1860 this single train skeleton clock features exquisite crossings of the wheelwork and plates which highlight Sinclair Harding's attention to detail and finishing at its very best. The frames, pierced out of solid Brass, are gracefully faceted, polished and burnished to provide a gleaming support for the four-wheel train. The Great Wheel has 288 teeth and makes only one revolution daily. This drives the centre wheel, which is framed, by the pierced chapter ring and bezel. A passing strike produces a single clear strike every half hour on a hand tuned bell. The mechanism is unique to Sinclair Harding and has been created to maintain the symmetry of the design. Two hammers act on one bell and strike the alternate hours. A simple lever hidden under the base can be used to silence the strike at night. The movement is mounted on two ornate pillars and appears to be floating over the base made from a sandwich of decorative Brass plates and a choice of a selected wood or marble. The clock is protected by a bevelled glass shade, which does not need removing to wind. 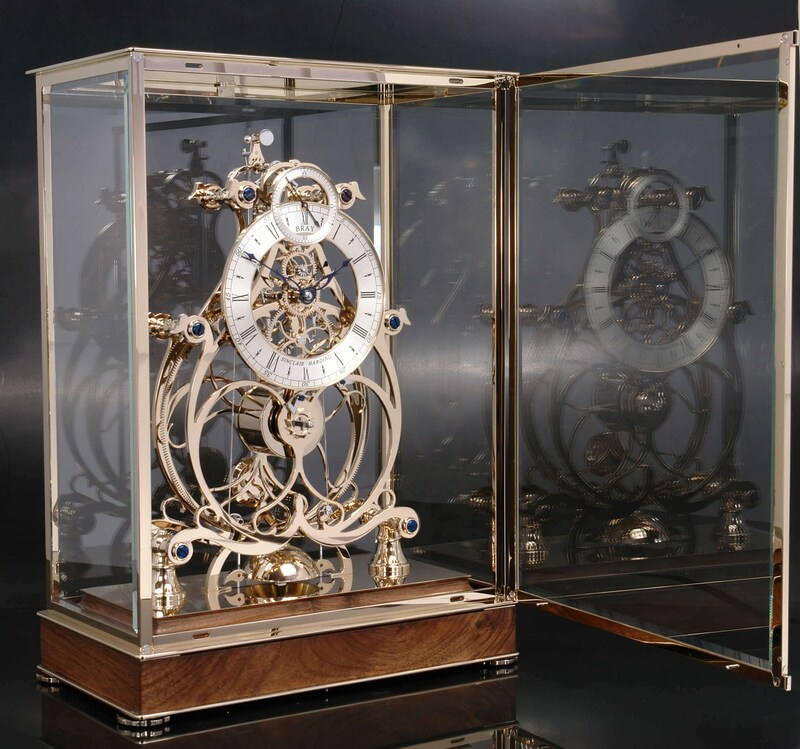 The Condliff Clock can be finished either in Gold, Rhodium or a combination of Gold and Rhodium. HEIGHT : 48cm. WIDTH : 33cm. DEPTH : 18cm. The whole clock is protected by a brass bound bevelled glass shade with an opening door to allow easy access to the movement. Close up of the main chapter ring and seconds chapter ring. 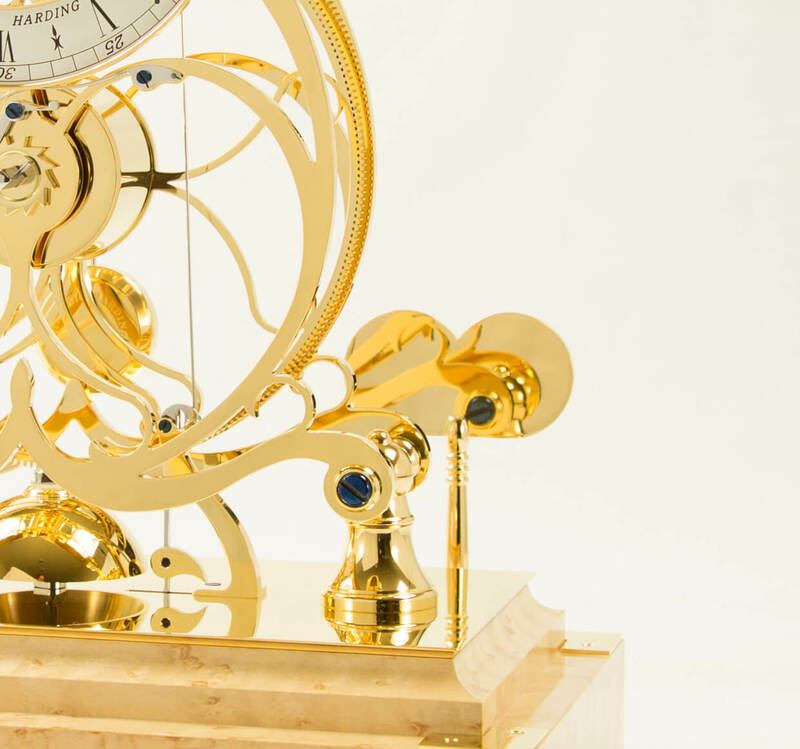 Each dial is engraved, wax and hand silvered. Each base is hand made and French polished in our workshop. Each base takes a number of weeks to French polish. The bell strikes on the hour from alternate levers. Each bell in manufactured and hand tuned in-house.